Las Vegas Aladdin Hotel receives $140 million face lift with set completion for the end of 2006 for this 2,587 room Las Vegas resort. 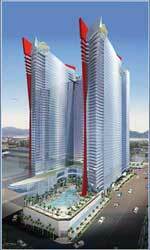 The Westgate Resorts Las Vegas timeshare and Las Vegas condos tower is located east on Harmon Avenue. The Las Vegas Planet Hollywood Towers, like the Strip façade, will be under a change of appearance. Some construction inside of the Planet Hollywood casino will be removal of a lounge to create more casino space. There will also be a new 1,500 seat auditorium and a retail area. The Desert Passage shopping mall will have new signage and better pedestrian corridors. Construction has been more complex and taken a little longer than expected because the property has stayed open while the crews continue with the remodel.